Proposed is a belt-wearable support for hands-free use of a handheld electronic device such as a smartphone. The support is made in the form of a case the back side of which is secured to a belt on the body of the user and the front side it tiltable forward due to bellows-like lateral sides. The interior space of the case is sufficient to contain a smartphone secured on the innermost member of the telescopically extendable mechanism formed by a group of C-shaped members slidingly fitted into each other. For positioning the smartphone at a required distance from the eyes of the user, which may view the information on the screen of the phone in a hands-free manner, the case is opened, the telescopic mechanism is extended to a required length, tilted to a required angle by an adjustable linkage mechanism, and is fixed in the selected position by a locking device. 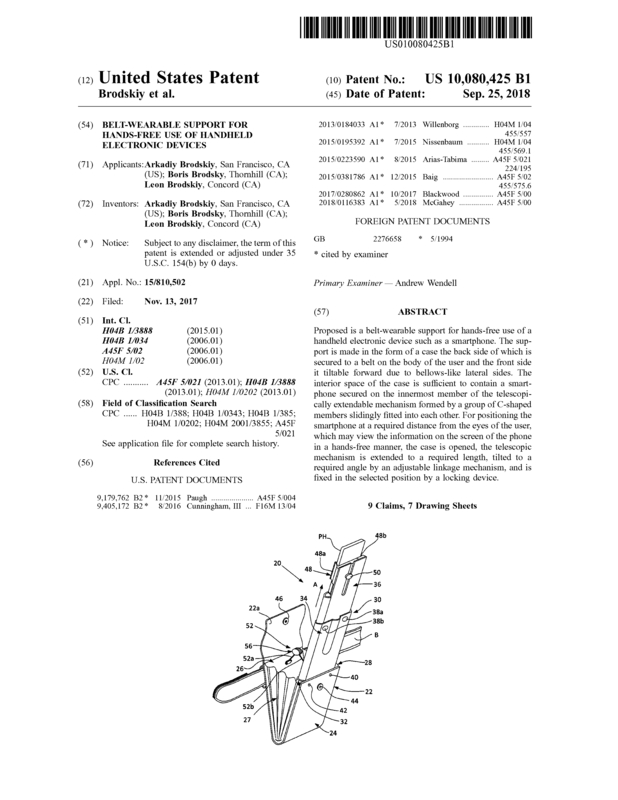 Page created at 2019-04-26 18:24:41, Patent Auction Time.